Rebuilding my bikes always seem to take me a while, partially because I am pretty busy with other stuff, and partially because of financial concerns. I finally completed overhaul of my early Allez . Its an 80 or 81 depending on who you ask and honestly I just don't care at this point because there is a distinct lack of knowledge about these bikes in general and a lot of speculation and opinions. No this bike has not been repainted and is 100 % original. I overhauled it and did replace the 38 CM bars because I can't stand riding narrow drop bars. Other than that here it is . Thank you I appreciate the kind words... I am starting work on my 87 Circuit soon , it will not be retain its Suntour Sprint group as I am planning on updating it to Dura Ace 7700 at least that's my idea at the time. I have complete 7400 group I could use but I thought adding a modern 9 speed drive train might be fun , and the Circuit does not have the value that this Allez holds to collectors. Very sweet. That Brooks looks completely out of place, though. A Turbo, Regal, Supercorsa, ect would look much better. But I'm biased, I don't like Brooks saddles at all. Thanks very much . I understand where you’re coming from in the saddle however Brooks saddles are the only ones I have found that are comfortable to me. I thought about a Rolls or similar saddle but honestly at this point I have learned what works and for my bottom end it’s a Brooks. Your Allez looks great! and I for one like Brooks saddles and prioritize fit and comfort over "period correct" any day. A Red 80s Allez or Sirrus is on my someday list. As to the too narrow bars, have several grandsons and granddaughters and these narrow bars should be really cool for their bike builds and....fit them. i saw a new but old one of those in a bike shop in hankock michigan. i thnk it was considerably newer vintage but still steel lugged frame. for only 400.00 i would have bought it had it been 2 sizes larger. great bike. the brooks is perfect imho. That is one beautiful Allez, taking time to do it right was an excellent idea, no matter the reason to stretch it out . Its almost like brand new in appearance, good job on this one, enjoy the smiles and miles. One-way ticket to Droolsville, please. Thank you sir , I appreciate everyone’s kind words and commentary. Last edited by SamSpade1941; 04-07-18 at 05:21 PM. Awesome! Is this one of the 3Rensho built ones? I just picked up this much Sirrus that I am really liking and I haven't even ridden it yet. Beautiful bike. I am a sucker for red ones! That's a great question and honestly I can't say for sure. Its an extremely early bike. Depending on who you ask here on this forum . Yes it is or no it's not; There are people who think they know one way or the other , and vice versa. But honestly its all opinion. I had one gentleman call me to make a cash offer on the bike who has said definitively that yes it is and he owns numerous early Specialized bikes. Others will say no because it doesn't have the offset fork crown. The problem is not all Konno built bikes had an offset fork and on and on and on we go. I can tell you this bike has all the lug features, and Shimano drop outs known to be used on the earliest Allez bikes. The Campagnolo drop outs came later on in the production. I talked with another gentleman on the phone who is almost certain this is one of the early bikes that was not sold as a complete bike and that it's a US made Allez . The one thing I can say I know for certain is that it is not any newer than early 1981 before the logo change and that its possible that it could be as early as 1979 which is when the first Allez frame sets were supposedly made and offered for sale. Very cool Sirrus by the way. I can't wait to see how you build it up. @tricky.....the early Allez frames designed by Tim Neenan were built by 3Rensho's Yoshi Konno. About one year ago, Tim sent me this picture of Yoshi and himself outside the shop in Japan. 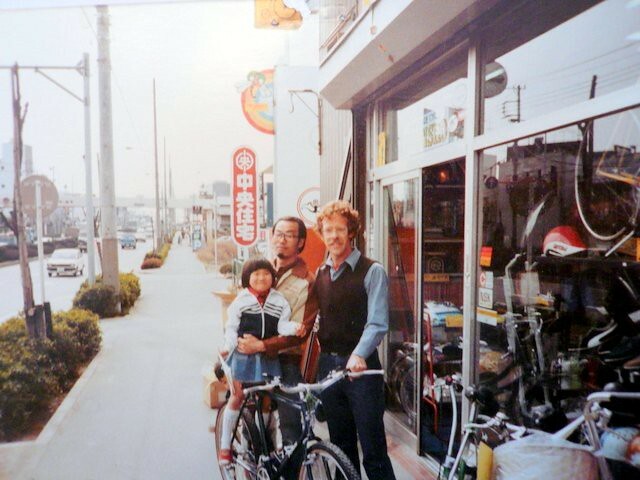 If I recall correctly, Tim told me the little gal on the bike is Yoshi's daughter. I have one of these bikes, an '82 or '83 version, and it is a joy to ride. Last edited by Dean51; 04-07-18 at 07:38 PM. It's interesting seeing an Allez with the old Campy stuff, as I've only ever seen them with Japanese componentry. It really changes the character of the bike and isn't at all what I was expecting when I opened the thread. Very cool. And I wish I had your patience. Thank you I appreciate it very much, as I said earlier it came with the Nuovo Record. Even my friend here in Salem who is an old racer from way back comments on how he remembers the ones he ran across back in the day having Suntour Superbe drive-trains. They were spec'd with Campy for the top of the line in some of the early years. Sinyard built the company with some of Campy's money so he was somewhat loyal to them for awhile. @merziac thats some interesting history I did not know about the early Allez bikes. Interesting find and its almost what I want. I have not sipped the 650b kool aid though and would prefer to keep it 700C for fleet commonality. I will probably be forced to wait till a center pull Hillborne frame shows up in a 56CM. I for a little bit I tried to convince myself that I'd like the double top tube one that's on a certain auction site right now. But the truth is I can't bring myself to like the look of double top tubes even though it may not be a totally bad thing considering my size. That blurb is oversimplified a bit, but you get the idea, I looked up the catalogs yesterday and found I think the 81? that listed many Campy parts. Like I said before, the path to greatness was long and storied for the big S.
You might want to temper your sights for a riv, finding one your size for a reasonable price can be challenging to say the least. I don't think you would ever need a double TT considering your size, although I think they are pretty cool and would have one just for the aesthetic alone even if they are a bit stiff and harsh by some accounts.